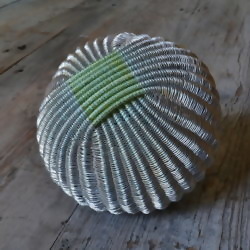 I make small woven non-functional decorative objects. Originally learning to make traditional willow baskets, an introduction to textile basketry and the suggestion to try some different materials took my making in a new direction. 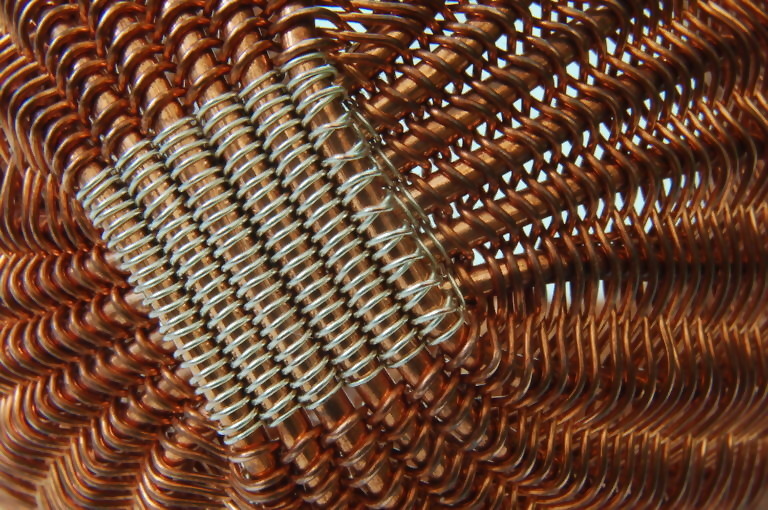 Working with fine flexible materials, I weave using adapted traditional basketry techniques. My favourite technique is twining. It requires the weaving of an active element around a passive warp. The weaving gives a smooth, slightly undulating surface. Although repetitive and time consuming, the placing of each weaver informs the final piece. 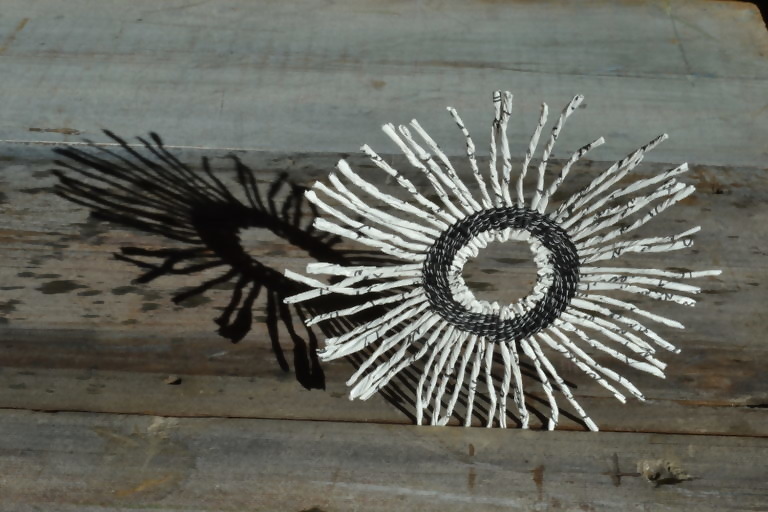 I am currently developing my work, to combine my curiosity in the links between basketry and textiles, connect with an interest in heritage and use my hand skills to visualise mathematical thinking. A large portion of my practice is sharing what I do. With a background in primary teaching and museum education, I greatly enjoy running workshops and giving talks; sharing my enthusiasm for making and the passing on of skills. My aim is to introduce new audiences to basketry in the hope that they may find it as exciting as I do. Twined pod woven in copper with silver plated detail on base. Motif woven as part of work entitled Significant Figures in remembrance of my Grandmother’s boyfriend, Cecil, killed in action in France, 1916. Each motif represents one year of remembering. 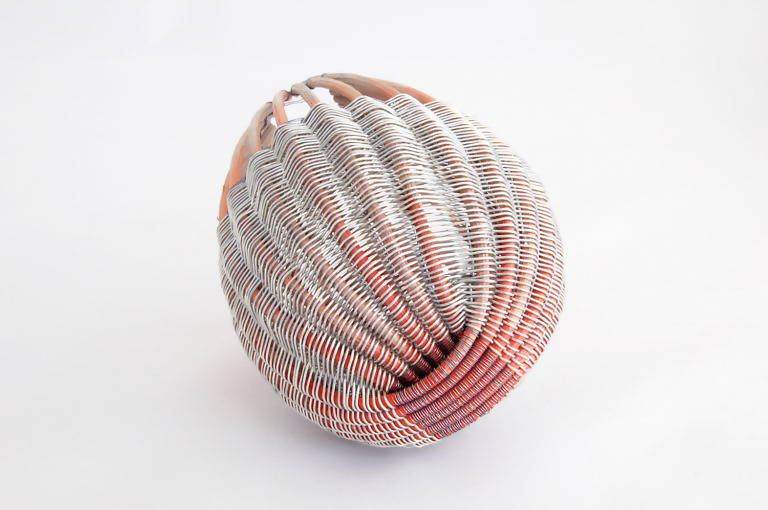 Pod twined in painted centre cane, aluminium and coloured copper wire.